March was an exciting month for the doggles as they had their first encounter with snow (twice! ), we were lucky that the horses routine wasn’t too disrupted thanks to our facilities. Even the grass canter track came into its own for team sledging activities! The pond has been a hive of activity with 6 swans battling it out for residency – which the doggles have been enjoying as a spectator sport, however our horses aren’t quite swan proof just yet! 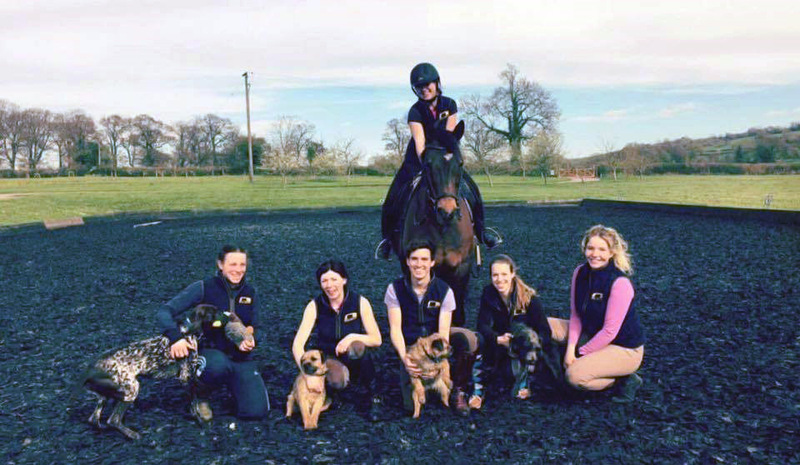 Liza held another successful Banwell Pony Club rally after the snow melted, and her Collective TeamQuest riders have also been training hard – unfortunately 2 of their shows were cancelled because of the snow! All types of horses continue to come through our gates, this month we have an endurance horse in for schooling with Liza whilst her owner is on holiday – if you would like your horse to stay in work whilst you are away this year do get in touch to book in, very limited spaces are available for short term schooling! Kathryn had a successful outing with Lexi to Allens Hill, with a personal best of 69% in their para test – with the exciting news of selection for an International next month! Livery client, Bonnie has enjoyed competing Wiets with her new Johnny Cash freestyle thanks to Tony Hobden at Equidance. Alex’s judging diary is rapidly filling up, this month he was judging at West Wilts. There is also the exciting news that he is now supported by Woof Wear as well as Amergio saddles! Following training with both Lara Butler and Gareth Hughes this month his horses are ready for the upcoming shows! The first pole work clinic of the month with Liza unfortunately had to be cancelled due to the snow, but there was a busy clinic on the 24th and the next batch of dates for the summer have been finalised! Come and join in the fun with one of the group lessons! 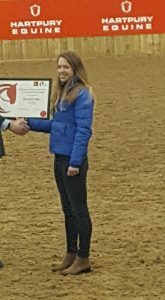 At the BHS International Convention held at Hartpury College Liza was awarded her Stage 5 Performance Coach certificate (new BHS I award). Bardot our wonderful schoolmistress has now been retired, fit and well to a quieter life as she turns 22 this year. She has been incredibly popular over the last couple of years helping all sorts of riders, whether on the lunge with their position, or helping with confidence or gaining the feel of lateral work and her favourite medium trot! She is certainly going to be missed by her long term regular clients whose riding she has helped transform!